Mailbox Monday for July 24 and Montreal Book Bloggers Meet-Up! After I began marketing my book in 2009, I discovered the wonderful world of book blogging. I began book blogging myself and shortly thereafter organized a tour for my novel Daughter of Mine. 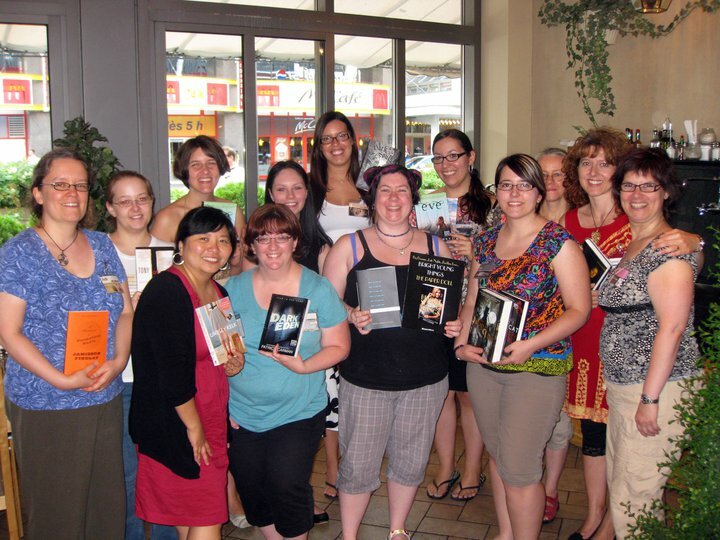 That's when I really discovered some awesome Montreal book bloggers! When Cindy from Cindy's Love of Books and I decided to try to find more Montreal bloggers, we came across a group that had already formed a Facebook page. Now there are 15 of us! And this past weekend (Sat, July 23) thirteen of us met as a group for the first time. PK @ Aisle B in red dress, Cindy @ Cindy's Love of Books, Cat @ Beyond Books and Lisa @ starmetal oak. Avis @ she reads and reads, Amanda @ Tales and Treats, Melissa @ YA Book Shelf, Jennifer @ Mrs Q: Book Addict, Cindy B. @Tynga's Reviews, Lucy @ Moonlight Gleam's Bookshelf, Donna @ Book Bound, and me with my arm around Tina @ Bookshipper. The purpose of our meet-up was to get to know one another, trade books, and brainstorm about how to get publishers and authors to know about us so we could be more involved in author events. I discovered we are a varied group of mixed ages who read all kinds of genres. If you want to know more about our blogs, you can visit our Montreal Book Bloggers website and also join our Facebook page where we chat about our events. 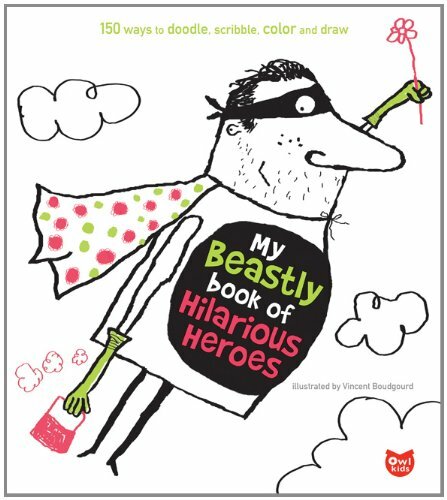 Featuring tons of made-up heroes and heroines, My Beastly Book of Hilarious Heroes is filled with over 150 doodle and scribble activities to give budding young artists hours of fun. Like the other titles in the My Beastly Book series, My Beastly Book of Hilarious Heroes aims to push kids’ latent illustrative creativity into curious new directions by presenting them with silly scenarios and open-ended instructions. With more than 150 new doodle and scribble activities for budding artists, this latest addition to the My Beastly Book series will fuel kids' creativity and inspire their minds. 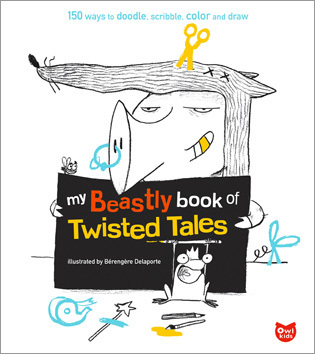 My Beastly Book of Twisted Tales is full of twisted takes on childhood fairy tale favourites like the Three Little Pigs, Little Red Riding Hood, Jack and the Beanstalk, and Sleeping Beauty, and features scenarios starring ogres, goblins, dragons, and princesses, too. Kids will dirty Cinderella's ballgown, decide what ingredients would go into their own magic potion, give a sunbathing Snow White a sunburn, and transform a prince into a toad. This was a fun-filled booky weekend! I really got spoiled. So what did you get in your mailbox last week? Hi Laura, it was great meeting you. I didn't expect so many people to show up. It was so much fun. I received Lady of the English as well this week and I'm very excited to read The Book of Lies. Happy reading! Looks like the blogger meet-up was a fun event. I don't know any other book bloggers in my city (Minneapolis) but I'm sure they're out there! I really want to read Lady of the English among others on your list. I am so jealous that there are so many bloggers near you. There's nothing like getting together with other bloggers and your meet-up sounds like so much fun. You had an amazing mailbox. I'm sure my son would have loved the beastly books. I was so happy to finally meet you, Laura, and thanks again for picking us and all the books up! I love the way you wrote this post -- mine was so long already that I couldn't see how to work in the info about the purpose of our meet-up (other than the obvious "getting to know one another and trading books"). Thanks again for all the books you gave me, especially for bringing me ones I hadn't even requested! I hope we do this again soon! You guys are doing great stuff! I'm dying to get my hands on Lady of the English! Looks like you had a wonderful time! I wouldn't even know where to start with all of those books. Can't wait to hear what you think about The Book of Lies. What a great group we had. I had a blast and next time we'll have to definitely get crackin' at our fave reads. Lady of English looks like fun! And the children's books look hilarious! I hope your children enjoy them. And as Avis has already mentioned - thank you for giving us a lift! I don't know how I would've got home otherwise! You're welcome for the ride. It was fun being a van full of girls heading downtown to meet other book bloggers! Your get together sounds like it was a blast! I envy you all living so close together! And I am pretty sure that is one of the best mailboxes I have seen! Enjoy! It was such a pleasure meeting you Laura! Spending the day with all you lovely ladies was a blast! I can definitely say I cannot wait for the next meetup! Great post!